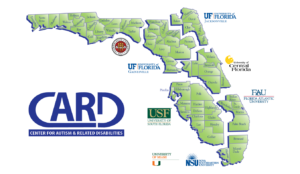 Florida is home to many individuals with autism and related disabilities. In response to their needs, as well as those of their families, seven regional, nonresidential CARD resource centers have been established at Florida State University, the University of Central Florida, the University of Florida at Gainesville, the University of Florida Health Science Center at Jacksonville, the University of South Florida, Florida Atlantic University and the University of Miami & Nova Southeastern University (UM-NSU CARD). CARD services are designed to build on the capacities of state and local resources, not to duplicate or replace them. The Centers are funded by the Florida Legislature through the Florida Department of Education, and all services are provided free of charge. A constituency board comprised of family members representing persons with autism and related disabilities meets regularly with the Centers staff to provide guidance on policies, priorities and activities. In the 2017-2018 year CARD supported over 64,500 individuals with autism spectrum disorders (ASD). In addition to the direct services provided to these individuals, CARD also provides consultative supports to their families, educators, medical professionals, social workers and other professionals, as well as local businesses and organizations that collaboratively work with the Centers on behalf of people with ASD. Our staff interacted with more than 197,000 people in 2017-2018, and our contacts continue to grow each year. The Centers have been providing services and supports at no charge to individuals with autism spectrum disorders and their families for 26 years. CARD is the largest state-wide model program for autism supports in the United States, and is now being replicated in other states across the nation. All funds generated through events sponsored by CARD are used to enhance or develop needed supports and services for individuals living right here in the state of Florida. CARD provides support and assistance with the goal of optimizing the potential of people with autism, dual sensory impairment, and related disabilities. All people, regardless of their abilities, have the right to live as full participants in society. People with disabilities are members of families. All families have strengths and capacities and have the right to be treated with sensitivity and respect, and as integral members of a person’s system of support. People with autism and related disabilities are entitled to supports and services that have been empirically demonstrated effective and described in scientific journals. This is the largest autism-related conference in the state of Florida and is rapidly gaining recognition throughout other states and countries. It will feature numerous presenters who will link autism research and autism intervention for 900-1300 professionals and parents of individuals with autism and other developmental disabilities.